Twenty years ago this week, when Ross Rebagliati won the first-ever Olympic gold medal in snowboarding and promptly tested positive for marijuana, sports fans around the world had just one question: How can weed be performance-enhancing? The positive test was no joke for Rebagliati. He was temporarily stripped of his giant slalom gold medal and spent a night in a Japanese jail. Rebagliati got his medal back on appeal because nobody at the International Olympic Committee had gotten around to adding marijuana to the list of performance-enhancing drugs. That’s a pretty ironic oversight for a bureaucrat organization trying to shame an athlete for being a stoner. But weed is not illegal everywhere. Even as the Jeff Sessions Justice Department doubles down on ‘Reefer Madness’ rhetoric, nine states and Washington, D.C., have legalized marijuana for recreational use, and medical cannabis is legal in a further 29 states. Starting in July, recreational marijuana will be legal throughout Canada. The rules are also relaxing for Olympians and athletes in other sports. In 2013 the World Anti-Doping Agency (WADA) changed its policy from prohibiting any marijuana use by athletes to banning it only during competition. Because testing doesn’t show when an athlete last used marijuana, WADA increased the threshold for a positive test by 1,000 percent, from 15 nanograms of THC per milliliter to 150 ng/ml. Testing for weed is an inexact science, but as weed advocate Allen St. Pierre told USA Today, you’d have to be a “pretty dedicated cannabis consumer” to hit the new threshold. Rebagliati’s positive, which he has always maintained was caused by secondhand smoke, was 17.8 ng/ml. Even more significantly, WADA removed cannabidiol from the Prohibited List. Commonly called CBD, cannabidiol is a non-psychoactive component of marijuana believed to have powerful anti-inflammatory properties. That could be a game-changer for athletes and where weed’s performance enhancing properties lie. A host of prominent athletes have been outed as marijuana users, including swimmer Michael Phelps, who served a three-month competition ban after photos surfaced of him ripping a bong in 2008, and scores of NFL players including the eponymously named Eagles running back LeGarrette Blount. Phelps is the most-decorated Olympian in history with 23 gold medals, and Blount just won his third Super Bowl. Maybe weed is performance enhancing after all. Rebagliati sure thinks so. Though he says he didn’t smoke in the 10 months before Nagano—he’s never wavered from the Spicoli’s van defense—Rebagliati was a regular cannabis user until snowboarding was added to the Olympic program. 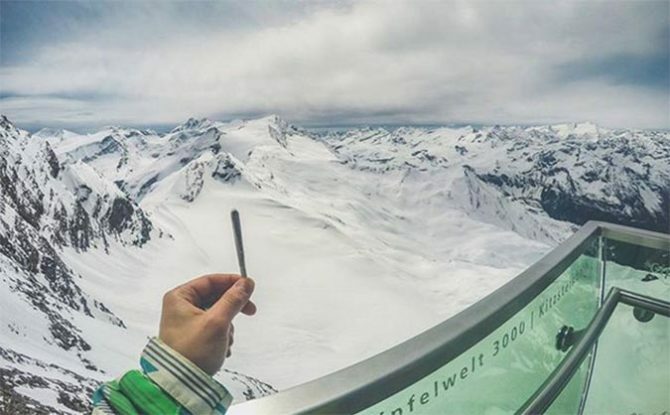 He now runs a cannabis brand in Whistler, B.C. called Ross’ Gold. “I was known as the guy on tour that loved smoking weed,” Rebagliati told me in an interview Tuesday. That changed in 1997 when the IOC recognized the International Ski Federation (FIS) as the governing body for Olympic snowboarding. The power-play sidelined the International Snowboarding Federation, prompting three-time halfpipe world champion Terje Haakonsen to boycott the Olympics in protest. It also made dope illegal on the world cup tour, since the FIS had a standing ban with a 15 mg/ml threshold. Rebagliati didn’t like it, but he quit weed long enough to win the gold medal. Other athletes say marijuana can help with mental focus and soothe competition anxiety. There’s not much scientific research on the subject, because marijuana is still a Schedule 1 controlled substance under U.S. federal law, making it tough to get the research-grade dank good science demands. Writer Gordy Megroz ran his own investigation for Outside magazine back in 2015, using himself as a guinea pig to test the effect of cannabis in a variety of workouts and outdoor sports. On skis, he wrote that he “felt invincible and proceeded to attack the steepest lines without fear.” On the mountain bike he reports feeling “flowy and fast,” but then misjudged a turn and rode straight off the trail. Like any other drug, legal or otherwise, marijuana has negative and beneficial effects. But the best argument for athletes to use cannabis may be that the side effects are less harmful than alternatives such as anti-inflammatory drugs, which can be hard on the stomach, liver, and kidneys, and highly addictive opioid painkillers. “The truth is that NFL players have been proving the viability of cannabis as a pain medicine for decades,” former pro Nate Jackson writes in an L.A. Times editorial. Using his own experience as an example, he makes a compelling argument for marijuana in place of the highly addictive opioid pain pills that are ubiquitous in the league. Cannabis doesn’t have the flat-out performance benefits you think of when you hear the term “Performance Enhancing Drugs.” It won’t make you jump out of the blocks like disgraced sprinter Ben Johnson on steroids. It won’t get you to the top of Alpe d’Huez like Lance Armstrong on EPO. It won’t even give you the boost athletes routinely get from bogus prescriptions for asthma, attention-deficit and thyroid medicines allowed under WADA’s gargantuan therapeutic use loophole. The Norwegian Nordic ski team brought 6,000 doses of asthma medication to PyeongChang. Who would have thought a pack of asthmatics would rack up so many gold medals in the world’s toughest aerobic sport? What cannabis can do, Rebagliati says, is help with recovery and pain management.